1:49 PM Well, clearly, there hasn't been much to report on in a while! Sophie is doing very well. We will go to Chapel Hill tomorrow for yet another "poke," this time to check Sophie's counts. At our last visit, Sophie's ANC (the number we watch to see how her immune system is holding up under chemo) was low--0.9. That was a bit surprising since she wasn't fighting off an infection or anything. Of course, now she's been coughing for a few days and has even thrown up/been nauseated once or twice in the past several days. Still no fever, and for the most part she's feeling fine, just a nagging cough and the occasional throwing up. I hope that it is nothing, or maybe just allergies or yet another upper respiratory thing. Adjusting the meds is always a pain (we deal with it), but I think we're getting "senioritis" with this whole treatment thing--we've got just a few months more and we're already over it. Although our life is definitely returning to "normal," it's times like these (when Sophie's not feeling well) that we definitely feel like we're living on the edge. That, combined with an impending move this summer (no word yet on where we're going, we just know we're going to move) means there's a lot of uncertainty in our household. I for one am not handling that uncertainty very well. I have a strong preference for order and predictability (I'm half German, after all), but having a child with cancer shoots that out of the water, and being a Methodist minister shoots that out of the water too! Ah well, we all have uncertainty in our lives, don't we? 8:42 PM Surprise! Surprise! Although we had planned on taking Sophie to UNC tomorrow morning (late) for a blood draw, Susan turned right around after coming home from work today and took Sophie this evening. The reason? Sophie had spiked a fever of 103 degrees after I picked her up from day care. Sophie said one of her teachers had checked her temperature earlier, but it was fine. It's a little disconcerting that she had a fever when I picked her up (bad, bad parent), but I suppose there is some comfort to know that it had been fine earlier in the day. I haven't yet heard from Susan, so I'm in limbo. I assume that they have gone to the Children's ER at Chapel Hill where Sophie will get a blood draw (counts and culture, to check for bacterial infection) and IV antibiotics. At some point (probably several hours into the night) we'll get some status report on how things are. We're really hoping that Sophie does not get admitted, but we will certainly deal with whatever happens. We always do. 8:51 PM Just got off the phone with Susan. They will be admitting Sophie. No word yet on her ANC (how her immune system is holding up), but based on other results, they want to keep her there for a while yet. There is some concern that Sophie has pneumonia, although the chest x-ray wasn't 100% conclusive on that. Her pulse ox is also a little lower (low 90s) than normal. All in all, it will probably be a long night for our family (and the two of them did not pack pajamas or a change of clothes!). 10:01 PM Here's the latest update--Sophie and Susan are coming home! Sophie's ANC was 2.2. Her chest x-ray definitely did not show signs of pneumonia and her pulse ox improved. She had IV antibiotics and we'll wait to see if the blood cultures grow anything in the next day or so. Now, for the bad news. At UNC the Emergency Room parking area requires that you hand over your car keys when you check in (parking is a nightmare there). Susan found out that our car had been hit in the parking lot. The other driver got out of her vehicle, checked the damage to both cars and drove off. Fortunately, the valet and at least two eye witnesses noticed the license plate number and turned it in to campus police. Hopefully it'll be safe to drive home, but on top of all that we have to deal with, it certainly stinks to have to deal with insurance and getting the car repaired! Mostly, I'm just glad that Sophie and Susan are going to be coming home tonight. I hope they stay safe! 4:57 PM Thumbs up, thumbs down. Sophie uses the thumbs up sign to indicate how much she likes something, and, of course, thumbs down means she does not like it. 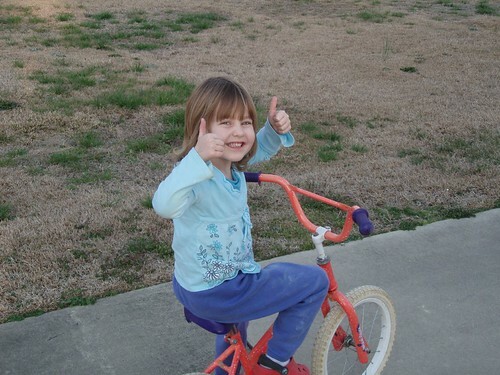 Here's a shot of Sophie riding a bike (with training wheels) for the first time this past weekend. Definitely a thumbs up--two thumbs up! Here is a shot of our Honda after last night's hit-and-run. Sophie is doing well today, although we kept her home just to keep an eye on her. We haven't heard from the doctors, so her culture must not be doing anything yet. Susan's mom arrived a little while ago and will help out for a couple of days. As for our car situation, some quick-thinking witnesses got the license plate number of the other driver and UNC campus police was able to track the owner down. We have the same insurance company, but (not surprisingly), they are not claiming responsibility for what happened to our car. I don't think they know (yet) that we have witnesses and a police report to back up our claims. We'll see what happens, but I gotta tell you, stuff like this certainly does not make us feel hopeful for humanity. I mean, you can see the damage on the Honda, and this person got out of her car, checked the damage to her car and to ours, drove off, and now is denying any responsibility. Whatever. I'm pulling for our insurance company to do the right thing. 10:12am A quick update on our car situation--the "other party" (as our insurance adjuster calls them) has accepted responsibility (I'm sure a visit from the police had something to do with that) and their insurance will cover the repairs and rental car costs while the car is being fixed. Susan will drop off the Honda on Monday when she goes in to work. This morning, Sophie told me that other kids at school take medicine (at school) and she wondered why she doesn't take her medicine at school. Well, I told her that the medicine she takes is very, very strong medicine to keep the leukemia away and that mommy and daddy want to be sure that she takes the medicine like she's supposed to. Of course, part of it is that we want to control the handling of these drugs and want to watch Sophie take them ourselves. I, for one, have taken for granted how everyday Sophie's treatment has become. It has been a blessing, to be sure, but it has also been a way for us (me) to deny the seriousness of the treatment. As I look forward to this final march of 72 days, I look back at what we've been through. I remember that the first time I read through that list of possible side effects (those listed above are strictly for the drugs that Sophie is/will be taking right now--not the ones she has taken and won't be taking again), I was just devastated and wanted nothing more to do with any of it. Thankfully, we have seen only some of these side effects (and, granted, some are very rare), but my gosh, Sophie has been through a lot! We all have.